Nonalcoholic steatohepatisis or NASH is a common, often "silent" chronic liver disease, occurring in people who drink little or no alcohol. Emerging antifibrotic therapies are aimed at inhibiting the accumulation of fibrogenic cells and/or preventing the deposition of extracellular matrix proteins. Fibrosis generally occurs at a low area percentage in tissue, and manual subjective evaluation cannot accurately discern discrete changes at low levels. 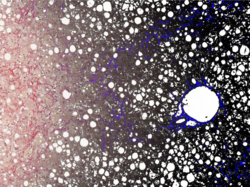 To address this obstacle, Flagship's quantitative Tissue Image Analysis (tIA) method has been used to determine precise percentages of induced fibrosis in various experimental animal models. Results allowed discrimination of induction and therapy-related reductions in collagen levels at less than 5% increments, and these changes can only be measured accurately with computer-assisted pathology. Data from tIA can be combined with histomorphologic and molecular data to allow greater utilization of animal tissue in antifibrotic drug development. This quantitative approach of measuring fibrosis is being applied to different liver fibrosis-inducing models and in different species. This same approach has also been applied to measure fibrosis in cardiac and renal tissues and is being investigated for use in pulmonary fibrosis animal models. Flagship's approach combines the expert knowledge of experienced scientists with innovations in digital pathology, leading to greater data accuracy and more efficient utilization of resources in drug development. Flagship develops new tissue analysis endpoints for use in both research and CLIA clinical trials as part of their histology services.